I hate winter (apart from Christmas of course)! I hate miserable cold weather. I hate how it’s dark when I leave for work in the morning, and dark when I leave work at night. I’m not quite as cheery in winter and I hate how it affects my skin and how I often end up with a cold sore or two (evil things!). 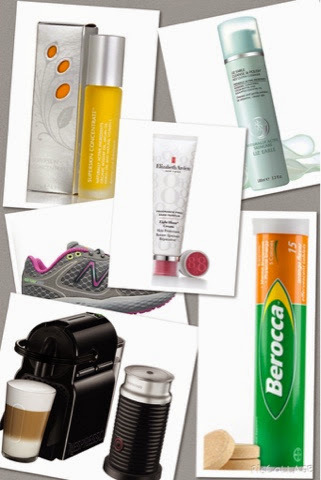 Berocca – definitely ‘me on a good day’! It makes me less tired and helps keep those pesky cold sores at bay. Liz Earle Hot Cloth Cleanser – a lovely rich cleanser. It’s removed with a muslin cloth, so you get a gently exfoliation every day. Liz Earle Super Skin Concentrate – the days I work, I spend quite a lot of time outside walking to catch trains, I also run a couple of times a week. As a result of being outside my skin can get quite dry. I’ve been using this both morning and night and my skin is lots better. Elizabeth Arden Eight Hour Cream – this is a cult beauty classic for good reason. I’ve used it for years, and it’s the best thing for treated dry, chapped lips. My Nespresso machine – Simon bought me this for my birthday last year. I wasn’t sure we’d use it that much, but we do. I love how it makes the milk all frothy and makes my coffee seem like an indulgent treat (even when using skimmed milk). It certainly provides a little pick me up during the winter months. Exercise – it really does help lift my mood. Running is my sport of choice. However, I do find it hard to motivate myself to get out at night when it’s cold and dark. I’ve recently started to do a spin class once a week. I’ve heard it will improve my running, plus it’s indoors! Investing in some new funky gear helps keep me motivated and encourages me to get out of the door. We’re now at the end of January, so not long till Spring! In the meantime, those above will help to keep me going. I’d love to hear your tips for getting through the bleaker months. Feel free to share. Next Post The twins are two!